The castes around the world are taking more and more space in the community and I wanted to sit down and talk to one of them to see what they think about casting and the community in all. 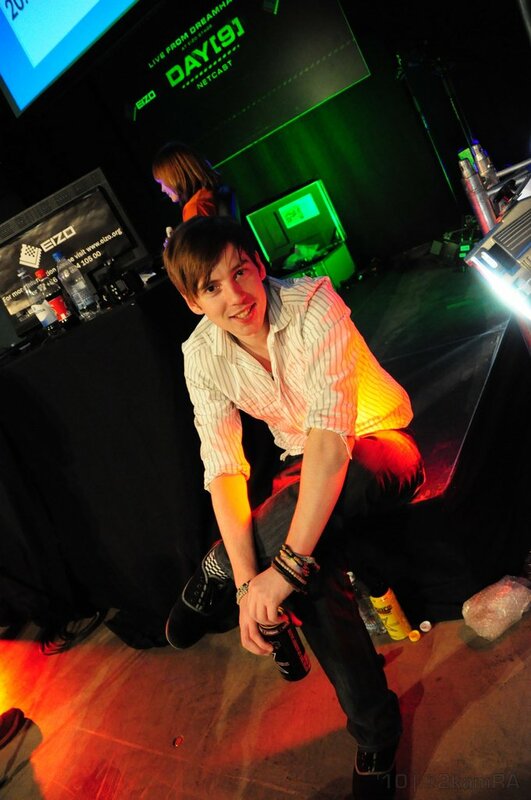 This time I will bring you dApollo that recently co-casted the Dreamhack Summer 2011 tournament with Sean “Day” Plott. Hello dApollo can you start with telling the readers a bit about yourself, who you are and what you do. Hello, I am Shaun ‘dApollo’ Clark and I am 21 years old, I am a member of team dignitas and currently live in the United Kingdom. I have been playing RTS games competitively since 2005 but currently I am working and living around Starcraft2, I am a professional coach, player and commentator, you may have seen me commentate such large events as Intel Extreme Masters, World Cyber Games and more recently Dreamhack. Let’s start form the beginning, what made you decide to start cast StarCraft 2 games? I initially moved to South Korea in the Summer of 2010 to play Starcraft2 with Idra, Artosis and Tasteless, I spent all my time playing there with them. I actually lived with Tasteless and we were really good friends, he pushed me more in the direction of commentating and when I arrived home in England around September 2010, I applied for the casting position alongside Day9 at Intel Extreme Masters Cologne to give commentating a shot. What is it that drives you to keep casting? First of all, the support of my fans and people who enjoy my casting, I will push hard and work harder to provide good commentary! They drive me forwards! To also have front row seats, to have the pleasure of commentating the best players in the world is a complete honour. I simply love the game, there isn’t a single day since Starcraft 2 was released that I didn’t watch a stream, watch a replay or even play myself. You have been casting live events lately, what made you succeed with your casting? To be honest, I don’t know. My initial cast at IEM wasn’t the most successful, it was the first time I had commentated and to open a debut at such a large event lol. I had a lot of negative feedback from the angry mob within the forums but I really enjoyed it, I spoke with Artosis and Day9 about it and they said I have the potential to do really well because my knowledge of the game is pretty high I just needed to tweak my mistakes, so thats what I did. Since then, after every event, I took feedback from other casters, other pro players and I worked hard on every single cast and change my errors and improve my performance. You have been doing some great co-casts with Sean “Day” Plott how is he to cast with? I have commentated with a lot of other people, but to have Sean to lead and to fall back on is great. He knows so much about the game that when there is something that I might get stuck on or not understand he can fill in and vis versa. He is never lost for words and will never drop the ball, he is consistently full of energy, while casting so its an amazing combination and a pleasure! I think the secret to success between Day9 and I is that we feed off each others energy and somehow manage to survive long broadcasting sessions. Day said that he has never been so nervous than he was in the Dreamhack Summer 2011 final between HuK and Moon, how was your experience casting that series of great games? The experience was amazing, I felt exactly the same but the biggest feeling came to me when HuK took the victory. I was so proud words could not explain, I am friends with Chris and we have been talking on and off since the beta, I remember after my first cast at IEM, he sent me a direct message saying I did an amazing job and wanted to thank me! I understand how much work he has put into his Starcraft, grinding it out in Korea for so long without stamping any huge wins for a while and to win a huge tournament like Dreamhack, is simple outstanding. Recently most of different tournaments and showmatches are promoting their event with the castes as the main attraction and not the players. What is your thoughts about that the casters getting so much fame in comparison to the players sometimes? Do the casters take to much space? I think this will obviously change in time, players are coming and going, winning and losing, commentators are always the same consistent face people see, so it makes sense at the moment. Until we get our Jaedong, our Flash of Starcraft 2, it will remain the same. Who’s your favourite player to cast and why? I was trying to think but I am not sure.. Probably SaSe at the moment from outside of Korea, I know he practices and works hard, I was so impressed by his group stage play at Dreamhack. You are a part of the dignitas organisation, what’s your role there? A bit about you future, what’s your plan in the near future? Are you booked on any major events during the summer? My next large event will be in Finland in the beginning of August for Assembly. I am currently trying to make and save enough money to move out from home so I can start streaming and uploading content, its a huge problem at the moment for me and thats why I don’t stream of have a youtube channel. Hopefully that will change in the upcoming months!! Thanks for you taking the time to answer the questions for the blog, anything that you want to add? Thank you to all my fans, everybody who supports me, it really drives me on, I really do appreciate it. Obviously a huge shout out to my team, team dignitas and all its sponsors, Alienware, Intel, Razer! Follow me on Twitter and check out my coaching! MLG Changed their minds about releasing the Anaheim replays? Buy your BlizzCon 2011 Virtual Tickets now!